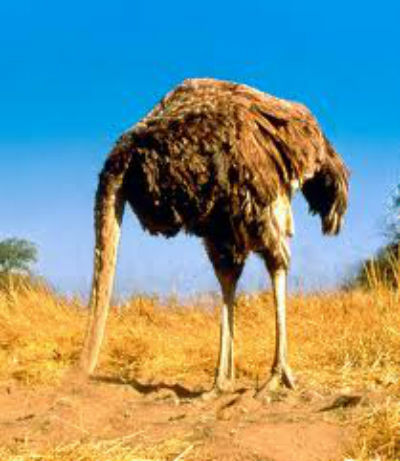 Have you ever seen a picture of an ostrich with its head buried in the sand? This is one of the funniest scenes in nature, but an unfunny, accurate metaphor to describe individuals who have a crisis care mentality about their health. This means that they only take care of themselves when they are sick, diagnosed with a disease, or are in excruciating pain. need to take a pill"
Many seniors and centenarians are suffering the consequences of their "if it aint broke dont fix it", ostrich-like attitudes. We are getting the advance notice that our parents and grandparents never received so we can think differently about health and pull our heads out of the sand. Do you have a parent or grandparent that lived to be 70, 80, 90 or 100 years old? Whether you like it or not, this is your minimum Innate, genetic potential. Your children and grandchildren share your genes as well, so become excited about your longevity, and theirs, and make the lifestyle changes now to ensure your health and vitality for a lifetime. Your mind and body will break down when there is interference in your nervous system. Just like a car accident will interfere with the flow of traffic, interference in your nervous system will cause dis-ease in your body which can lead to pain, sickness and even chronic disease. Sometimes you will have symptoms and sometimes you wont. Dont wait for the symptoms, the crisis, to remove this interference. Thats what an ostrich would do. Stay healthy by keeping this interference out of your life, your spine and your nervous system, regardless of how you feel. Its time for an Intervention. If you have an ostrich in your family, you can save their life and make a difference by intervening. Express your concern. Show them you care. Get help from others if you need it but dont let them become a statistic and "just another person" who was killed or injured severely because they were in denial about the dangers to their health. We are excited to be a part of your health care team. If you have an ostrich in your life, please send them to our office for an appointment. We would be honored to help them get their head out of the sand.